Since Ryley turned 5 and she is a big girl this year, we allowed her to choose what we would do as a family for our yearly pay it forward vacation day. Since she loved Longhopes Donkey Shelter in Colorado, she chose the Donkey Sanctuary in Aruba. The interesting part of the sanctuary is they were founded due to the number of donkey incidents on the island. The island did not always allow vehicles, so, the main form of transportation was the donkey. When vehicles were permitted suddenly the wild donkeys were being hit by cars. It is now one of the biggest sanctuaries for donkeys around the world. Before going, we asked what would Ryley be able to do at the Sanctuary, in which, the owners reply was 5 year olds can pitch in to do everything from feeding the donkeys, brushing and cleaning the donkeys, and cleaning their pens. Amazingly, she was right and Ryley did everything without complaining. She even picked up her shovel and began scooping poop without us asking. Due to the heat, my husband wasn’t originally happy about Ryley’s choice of volunteer activities, but by the end of the day he said he really liked the physical activity, getting to see the ranch land (which is very different then the beaches), meeting our helper who was there to finish his required community service hours, and generally getting the opportunity to help out. 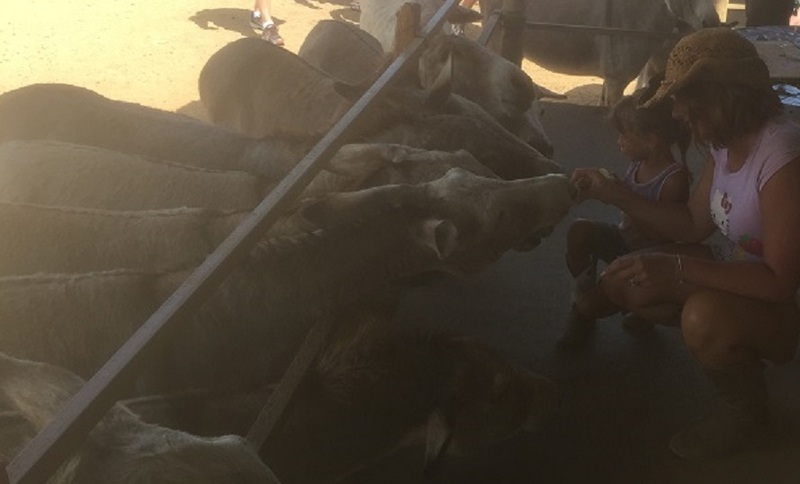 Our favorite part of the experience was feeding the donkeys the apples and bananas we brought with us. One donkey kept kicking the fence; which made us laugh because just like our dog – he was saying please come over here (who cares about the others) and feed me. As always, it turned out to be a great family bonding day and a great way to fulfill our “pay it forward” tradition of giving back to the communities we visit.